The majority of the Bidayuh electorate (15171)N17 Tarat will likely see a battle of two Rolands. The incumbent BN Roland Sagah Wee Inn (56 year old Lawyer) will likely be challenged by PKR Roland Nawe S. Abot (60 year old administrator). Our insider source informed us that they have been told by an official at PKR headquarters that PKR Roland stands a very good chance of being nominated by PKR. He has served as a District Officer in various districts in Sarawak (Bintulu,Lubok Antu,Selangau and Kuching) He looks the most likely candidate as PKR knows that he will give the BN candidate a worthy battle. Roland Abot will certainly not be a PUSHOVER and his wealth of experience will serve him well against the BN forces. 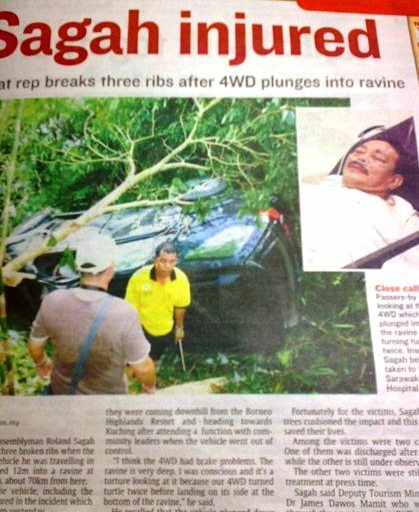 Roland Sagah who has sinced recovered from his car accident knows the Tarat constituency like the back of his hand. Many would have thought he would not be retain to defend his seat as word from the ground is that he has losts ‘touch with the ground“. However eversince the accident he has been working very hard and seems to have found a new lease of life. It is likely he will be called upon to defend the seat for the 4th time by the BN State leadership. He first won the seat in 1996 and won uncontested. audie61 made a phone call to PKR Roland and he said to us,”I will leave it to the PKR leadership to choose the right candidate for Tarat. My family is from Tarat and I have also served as District Officer in Kuching Division before and I know the area very well. The people know who I am and I am sure that BN will feel the “heat” and will know that they will be in for a good battle to see who will win the battle of Tarat between the two Rolands. It will be up to the BN/PBB and Pakatan/PKR to choose their own “winnable candidate” and many hope that the Battle of the Two Rolands will see the light of the day in the forthcoming Sarawak State election. Who is your money on….? ?